Our premium members have access to lesson notes or transcripts for each lesson of the course. It’s very easy to listen to the lessons and access the notes simultaneously on an iPad and this video will show you how. 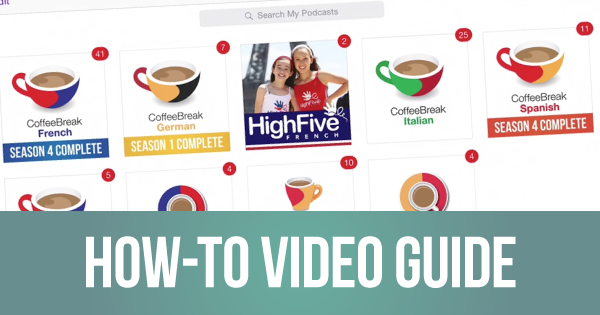 In this video we assume that you’re using the Apple Podcasts app on your iPad to store your lesson content. For more information about this, please watch this other Video Guide. From the Podcasts app, tap on the lesson you want to listen to. Once the lesson has started to play, tap the back arrow (top left) to go back to the list of files. Now tap the transcript. It will open initially in Safari. If you wish you can open the pdf lesson guide in iBooks and store it there with your other pdf files and ebooks. I would like to know if any of the lessons can be heard through Android platform/phones. Please advise. Yes, all our lessons feature a combination of mp3 audio, mp4 video and pdf documents so they can be accessed by Android phones. Hope this helps.